My picky 5 year old is obsessed with eggnog. Everytime we go to the store he has to buy eggnog. What is up with that? I had all of the ingredients on hand to make these and they were easy to whip up a batch. I love how these cookies meltaway in your mouth and have a subtle eggnog taste. They were delicious! Preheat the oven to 350. Line two baking sheets with parchment or spray with cooking spray. In a small bowl, whisk together the flour, corn starch, salt, cinnamon, and nutmeg. In a large bowl or the bowl of a stand mixer, beat together the butter and powdered sugar until light and fluffy. Add the rum extract, vanilla, and eggnog, and mix to combine. Add the dry ingredients and mix to form a thick dough. Shape the dough into one inch balls and place 1-2 inches apart on the baking sheets. Bake 12-14 minutes, or until lightly browned on the bottom. Remove and let cool 15 minutes, then roll in powdered sugar. Look yummy! Saw you over at Six Sisters! These sound wonderful. They would make a great Christmas cookie. 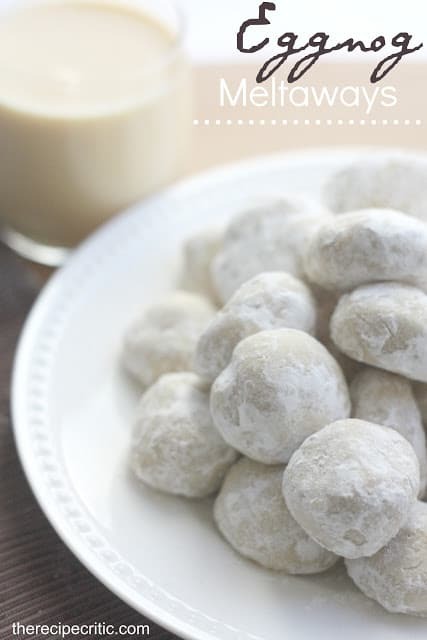 Right now I am patting myself on the back for buying the extra carton of eggnog…these are so being made this week!!! They sound awesome!!!! I just want too say I love,love,love eggnog so these will defently be on my Christmas tray’s. I hope people will like them as much as i’m going too…………Thanks for an awsome recipe……….. Please make your recipes printable. They are on the current ones since I switched over to wordpress. Just haven’t been able to go back to all of them and update it with the print button. Thank you for trying to make them printable. I have a file on my computer that has all of my recipes. I have had to ignore some awesome sounds recipes due to not being able to print them onto my computer. Fix this one soon please. These look soooooo good! Have a question however. I am from south Georgia and my great-grandmother made her “special” eggnog (just has a little of bourbon in it). Can this be substituted for the store bought eggnog? Do you really mean 1/2 cup cornstarch???? These look Fantastic and I bet they taste as good as they look. These are wonderful. I did grate some fresh nutmeg into them, just like I would sprinkle it into a glass of eggnog. I might even experiment with adding a bit of brandy next time. These could definitely become apart of my annual Christmas cookie assortment. Thanks for sharing..
Would these store ok or would you freeze them, I am thinking not to freeze ? They sound so good !! How about mixing the eggnog with a little maple bourbon and don’t change the measurements. If you mix too much…CHEERS! Just finished up making them and unfortunately they have a play-dough consistency in the middle, even though I popped them back in the oven for about 10 extra minutes. The recipe looked promising though- just wish they had been a little more “crumbly” in the middle and less goopy! I love eggnog. I just made these and they are very disappointing. I made as directed for my cookie exchange. Can’t tell there is eggnog in them and make sure to have a glass of milk when they ‘melt away’ in your mouth. Tastes like flour. Since the recipe was adjusted I want to make them for my grams using bourbon instead of rum, how many do they make? Making these for Christmas tomorrow! Would they keep well until 5 pm 12/25 if I made them tonight? Thank you!